The British poet Robert Herrick writes a fine sonnet about the allure of the slightly askew, the saucy, the off-beat–the messy in dress! Well, he has a point, but I don’t agree in general. I like neatness and appreciate the beauty of orderliness. Mother was a neatnik too, every hair in place under her prayer covering, the whole house scrubbed clean every Friday, a place for everything and everything in its place. 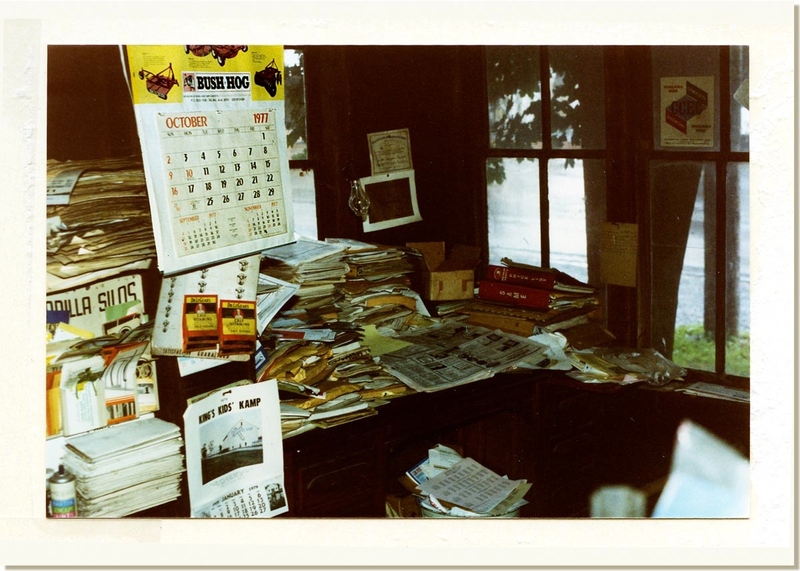 On the other hand, my dad, who was precise in the mechanics of fixing machinery in his farm supply business, was by nature messy, messy, messy–in his office, inside his truck, on the porch of his shop. Daddy’s messy manner drove me crazy. Besides, it was embarrassing! In the middle of the village of Rheems, the shop faced Harrisburg Avenue with two main sections, one behind the other. The front part housed dozens of storage bins for nuts, bolts, screws, odd implements and, curiously, a Victrola sitting squat right beside the door to the sales office. During planting season, bags of Royster fertilizer for sale would be deposited off to the side near a loading/unloading door. As you walked to the rear, a long wooden ramp led to the back section where the dirty work was done, Daddy and his helpers fixing disk harrows, plows, or welding broken parts. Behind the shop was an assortment of implements stored Sanford & Son-style from which the mechanics harvested parts. Occasionally, when Daddy said, “It’s time to sweep the shop,” I shuddered because I would be working in the cold with piles of stuff everywhere. Spritzing soapy water from a bucket to settle the dust, I watched charcoal-grey pustules of dirt and grease bead up on the cement floor, then tried to push-broom the filth into a dust pan, often an exercise in futility. 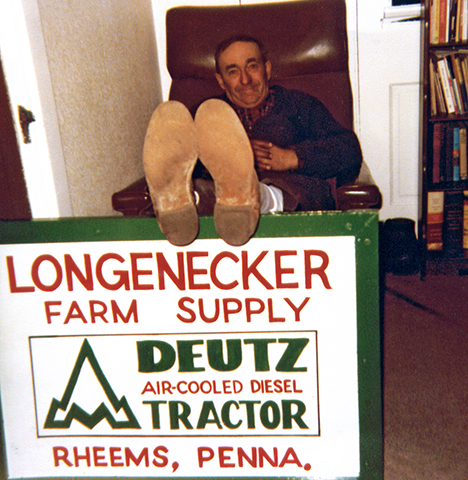 Though Daddy was messy, he had a strong Pennsylvania Dutch work ethic. At the shop six days a week, he caught up with office work and telephone sales in the evenings. “I worked like a Trojan today, and still didn’t get the Fox Harvester ready for Phares Weaver in time,” he’d say to Mother as he walked in the door. 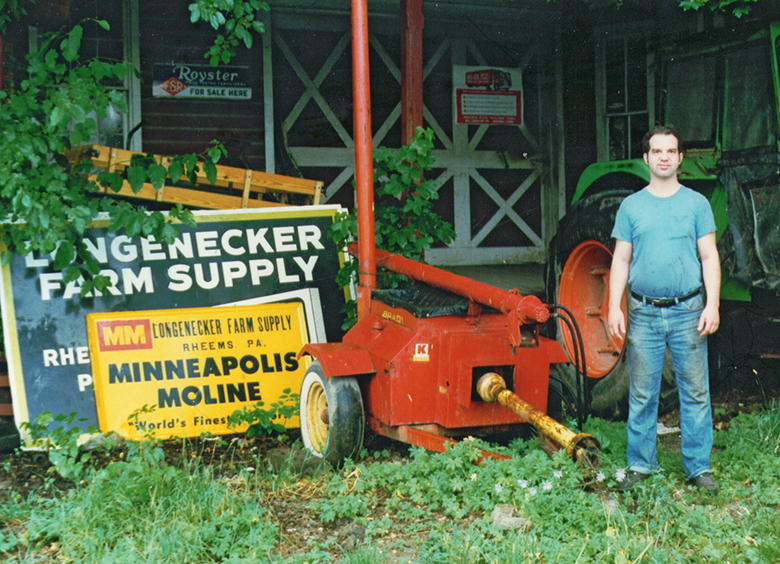 And he did so well in sales, dealerships would send him and Mother as VIPs on all-expense paid trips to Ohio, Florida, or Arizona to learn about new farm equipment. Once his sales were so high, his whole family, including three married daughters and son enjoyed a week-long vacation in Jamaica. This post began with an homage to the slightly slovenly, the off-kilter. It ends with a writer lamenting her neat freakiness. know it’s something, I’ve got to face. happen over night, or in just a day. Now it’s your turn: neat vs. messy — Can they co-exist? Is it possible to find a middle ground? Thank you for sounding out on this topic. Your thoughts please. They keep me going! And I will always reply. Next postAre You a Sneetch? My smile came when you said, “I know that is my lot in life: to live in harmony anyway.” Though I didn’t mention it here, my husband is a messy too except in his business life. He’s an artist and messiness ensues. A few times a year he does do major cleanups. I can live with that! I’m glad this theme resonated with you. I am flattered by your impulse to “steal” the topic. Go right ahead–use my link too. Thank you for stopping by and being the first to post a comment, Melodie. Wonderful picture of Daddy & his office. You must have known back then you would be writing a book. Bravo! I have no idea what I was thinking then. A conjecture or two: When we talk about the office in the future, no one will believe our outrageous descriptions, so here’s proof. Or maybe I shot the photo on a nostalgic impulse. (Thinking the latter would be kinder to Daddy’s memory, I suppose.) Thanks, sis, for the comment. Your coat hanger got me. Reminded me of writing my son’s names in their underwear before them going off to Boy Scout camp. They hated that. My husband has a huge shop of in a corner of our back yard. The neighbors were appalled when it went up. They thought the worst, but he had it built before he ever moved in here with me, so it would be grandfathered in before the neighbors had opportunity to vote it against the rules. Fortunately, like me, he is a neat freak there also. I love the pic of daddy taking a breather. He looked like he was comfortable in his element. Two neat freaks in the same marriage – I don’t think that usually happens in most relationships. I’m glad you like the photos, Susan. Thanks! I must be somewhere in the middle of this pendulum. When I have a project, I spread things all over the desk and floor. When I am working on one high priority project, the other ones pile up until I can get to them. I hate clutter, however. So I actually get depressed when it gets too bad. Right now, I have a stack of handwritten notes that need to go out and a set of notes sent to me that I have taken far too long to answer. I feel terrible that it took me so long to answer letters full of beautiful stories about people who read Blush and connected their lives to my life. I wanted to honor them with my own handwritten notes, which is why they didn’t get answered. I cleared off the top of the desk and put them in a drawer. Off to make amends. I will feel tons lighter when I have carefully replied to each person who sent me snail mail. Email responses got answered right away. I love the photos you posted here. Excellent question, too. I’ll share on my FB page. BTW, I wonder if my father ever visited your daddy in his shop? Shirley, I can relate for sure. Right now I have stuff that I refer to often in a structured bag on the floor, various stacks of current projects, and two folders of recently completed projects that I’ll need to find space for–somewhere. Like you, I tolerate messes when they lead to a project I can envision completing soon. You are to be commended for honoring each handwritten note, but with it comes the pressure to reply in kind. I would probably feel the same way. Scary thought: Think what may happen when you publish that second book? I hope you can take a breath, enjoy the moment, and feel the love of all those whose lives you are touching through BLUSH. Hi Marian. what a great topic. Neat or tidy? I believe I am both. And, like Shirley, while I’m still writing my book, I’ve got piles of related books, notes, earlier drafts, mementos, you-name-it, in piles all over my office (AND in no less than FOUR of those plastic — BIG plastic — storage boxes from Staples). One major motivator for finishing this book: I can then clean up my office. I LOVE a clean, orderly space. My own disposition seems to reflect the space I’m in. My first husband was a definite neatnik, it was much more important to him than to me. His garage was so clean we held picnics in it if the weather turned bad. Our neighbor once said he should get a Good Housekeeping Seal of Approval for his color-coded peg boards on the walls where he hung his tools. Yup. But, if I ever left anything out of place, he’d get angry. So, as luck would have it, my second husband is more like your dad. And while I’m forever “picking up his socks” (metaphorically) I’m also counting my blessings. Cheers. It sounds as though you have found your matching “sock,” Janet. Thank you for your true confession (about the Staples’ boxes!) and sharing some of your neat/messy experiences. We’ve all known that everyone has the same struggle, and these comments reinforce that. I know, without doing any Meyers Briggs type of testing, that I am M for messy. Though I do cooperate with the neatniks as much as I can. And, my husband is more N for neat. Thanks to my husband, I do regularly close my dresser drawers and various other things. I’m still learning to give thanks for my messy nature, because it doesn’t seem like a woman should be. There’s one dresser drawer that husband Cliff hardly ever closes all the way–just 1 inch shy of being really closed. It bothers me a little, but I stopped saying anything because it seems so trivial. One thing I’ve learned about writing, at least in my case: I just can’t let the creative juices run free if I feel a compulsion to tidy up all the time. Thanks for adding to the conversation, Dolores. I’m definitely a neat person. Clutter bothers me, and I can’t rest until the house is back in order. That doesn’t mean that I dust every weekend, so I think there’s a difference between neat and clean, but I put things away almost immediately. I’m glad you made that distinction: neat & clean. Dusting is my nemesis. Clean floors are a must for me, but when it comes to dusting I often use the “hand swipe” method. Yes, it’s come to that! You are so faithful to read/comment in spite of your full-time teaching and paper grading; I appreciate it, Traci! It may take me a day or two, but I always come back for more 🙂 And I hear you about the floors! I vacuum every week and clean my bathroom, but I eye a dust rag with a loathing heart. Thanks for taking time to respond in your whirlwind life right now. The trick is, I think, ability to function. If you are in the creative zone and able to push forward, a certain amount of messiness is good, maybe even commendable. Excellent post on so many levels, Marian! I can picture you trying to settle the dust and sweep up your father’s office…the flip-side of the perfect cleanliness and order of your mother’s kitchen. I hope that, despite your parents’ opposite attitudes about this, they complemented each other in many other ways. Maybe–coming from their diverse attitudes–is one of the reasons you have the combined beauty and understanding of both plain and fancy? Ah, Marylin–thanks for the insight. The value of having parents of different methods and manners is helping their children see the world from two different angles. If so, I am the beneficiary of that. I have told my husband more than once that if I didn’t have a messy Dad I could not handle his creative sprawl (read that “messiness”) as well as I do. Fun post — I enjoyed the photos you shared! I’m a “place for everything, and everything in its place” kind of gal. Like your mother, my handwriting is also precise. As a minimalist, I’m not a “clothes horse,” but the clothes that I do have hang in sleeve-length order from left-to-right, hangers precisely 2-fingers apart. The contents of my drawers look like sleeping soldiers lying side by side in precision. Never bossy or mean about it with others, I personally find a tremendous amount of comfort and joy in order. A creative person who has “the contents of her drawers that look like sleeping soldiers lying side by side in precision.” Now that’s an image I will hold in my mind for future reference. (I’m smiling now!) But you say it gives you comfort and joy. I say, “More power to you, my friend!” Thanks as always for the interesting anecdote. Laurie, I’d like to live with you. Or, in lieu of that, do you lease out on occasion? Maybe a clone? Surely something can be worked out. ??? You are too funny. Thanks for the chuckle. You touched a nerve here, Marian. I thought I would never get to the bottom to add my comment–they were all so interesting. 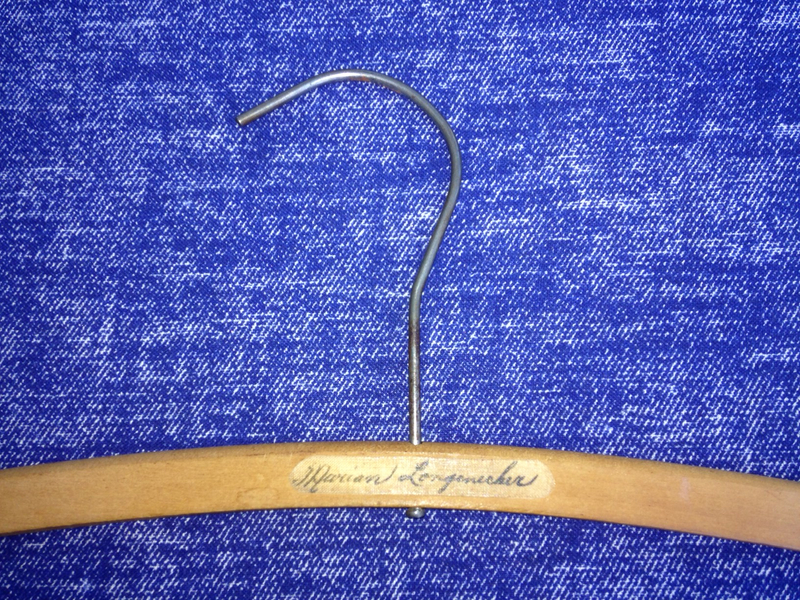 Your unique cursive signature on the hanger took me back to our college and teaching days when I so admired its exquisite style! As to the neatness/messy poles, I have often thought of it as a right brain/left brain attribute, and that it was something one lived with rather than trying to overcome it. My husband’s idea of organization is to arrange manila folders in stacks, crisscrossing them in a semblance of order. When the table or desk no longer was large enough, the stacks ended up on the floor. It’s getting better now that we are no longer in our split-level four-bedroom house which seemed to have endless space to fill. Our living space is now limited and the surplus goes into our rented storage unit! One day we will be where you are now, Verna. Cliff is still doing his art performances, and that is one of the reasons we are staying in our tri-level. But in my heart I know we can’t keep up the house and grounds (18 oak trees!) forever. In my mind, we are on a 6-8 year plan to move to a ranch-style house if not a retirement community. We have lived here over 30 years, and there would be a business + house to move. I dread it, but it’s an inevitable part of moving forward, I guess. Sometimes I would like to trade places with those who are situated where they plan to stay for the rest of their earthly lives. The trick is to be content. I believe the Apostle Paul had something to say about that. Thanks so much for responding to that touched nerve! So finally I find out from my wife Marian that I’m a messy. It’s admirable that she doesn’t talk anymore about the top dresser drawer that doesn’t quite get pushed in all the way. This way I don’t have to remind her that knives, forks and spoons have their pre-determined (by the husband) alloted space in the dishwasher. 🙂 Well, I think we can all agree whether someone is a messy or neaty it’s evident that it DOESN’T hamper their writing skills one bit. Marian, we enjoyed your pictures and your writings. I think I might have been with Daddy inside that building, but I’m not sure. I do remember often passing by that spot. Walter says if you have any more, he’ll enjoy looking at them also. I have been in your home a number of times. One thing I remember was your Dad singing, “Centrals never busy, always on the line, you can talk to heaven.. all the time” as he played his guitar. Always nice to hear from you and Walter! Great images and great story, Marian. I became a neatnik in response to my messy mother. She wasn’t messy before my father died when I was 14, but then she stopped worrying about piles of dirty clothes or unwashed dishes. I lived a relatively orderly life until my husband died in 2008. Now, as I work away on new projects at the computer or take free time to go into the woods, the dining room table where I dislike eating alone is piled with unsorted tax information and lunch dishes are still in the sink. My mother must be laughing from the other side–and I’m glad you can’t see my disorder. It embarrasses me. So funny, Elaine. Remember the post begins with the poem “Delight in Disorder.” If you can function as you are pursuing interesting projects, who’s to care! Thanks for stopping by again. Good point, Marian. Who’s to care? My dog doesn’t mind and I live alone now. I promise I know how to straighten things out before company comes–and my mess is relatively superficial. Those tax documents will be filed tomorrow, but in my new life, I let them sit on the table all night. Not that I’m keeping track, but I am happy to add you to the “slightly askew” side. Many creative people avoid the orderly and neat, especially while they are in the “zone.” Happy to see you here today. Come visit again soon.